Welcome to Israeli Emotional Roller Coaster Week! Today is Rosh Chodesh Iyar, the first day of the month of Iyar. It’s a cartoon by Shai Cherka that was printed in the Makor Rishon newspaper. It shows a steep roller coaster track with a man holding on for dear life, his kippah about to fly off his head. At the top of the hill he’s coasting down is a yellow Jewish star with “Jude” written on it; at the bottom of the drop is a torch propped up with rifles; and then the track shifts into the blue strips of the Israeli flag, with the blue Jewish star at the center, as it takes a sharp turn upwards. This is a perfect visual representation of what the two weeks after Passover are like in Israel. Towards the end of Passover, you start to notice some blue and white streamers popping up along the roads. Then, you start spotting teenagers at intersections, selling Israeli flags that fit onto your car window, usually around 15 NIS a pop. I can’t tell you how many of these we have lost by opening the window while driving at high speed. A couple years ago they started selling these cute sideview mirror covers that lack that disadvantage. And the flags start appearing on windows and street lamps. At the top of the metaphorical roller coaster is Holocaust Remembrance Day. The importance of this to our national identity has already been described in that post. A week later, we have Memorial Day, in honor of the fallen soldiers and terror victims. The very next day is Independence Day (Yom Ha’Atzma’ut), the 5th of Iyar, which is the day Ben-Gurion declared independence. Now, remember–Jewish days begin and end at sundown. So Memorial Day begins at sundown this Tuesday, and at sundown on Wednesday, the whole country makes a sudden and very dramatic shift from solemn mourning to joyous celebration. This may seem kind of jarring, but to us it makes perfect sense. We cannot celebrate our independence without first expressing our gratitude to those who gave their lives for that freedom. Last week, we remembered the victims of the Holocaust, standing as a symbol of the culmination of all Jewish persecution and suffering over the centuries. Then, we acknowledge those who died for our country. Only then can we celebrate our national independence, the miraculous realization of a 2,000-year-old dream. As a kid I remember being struck by how Israelis seemed to connect less to Holocaust Remembrance Day than to Memorial Day. To me, the Holocaust was a tragedy so much more awful in every possible way. What I didn’t quite understand at the time was that even grandchildren of Holocaust survivors tended to have much more up-close-and-personal experience with death in the context of wars and terrorism. There is not a single Israeli who didn’t have at least a casual connection with someone who was killed in a war or a terror attack. It’s a small country. Serving in the army is mandatory after graduating high school. It’s fairly impossible to avoid. Memorial Day is observed similarly to Holocaust Remembrance Day. A one-minute siren sounds in the evening at 8pm, and another, for two minutes, at 10am the following morning. Flags are lowered, ceremonies are held, graves are visited, candles are lit. Soldiers stand at attention during the memorial siren on Mt. 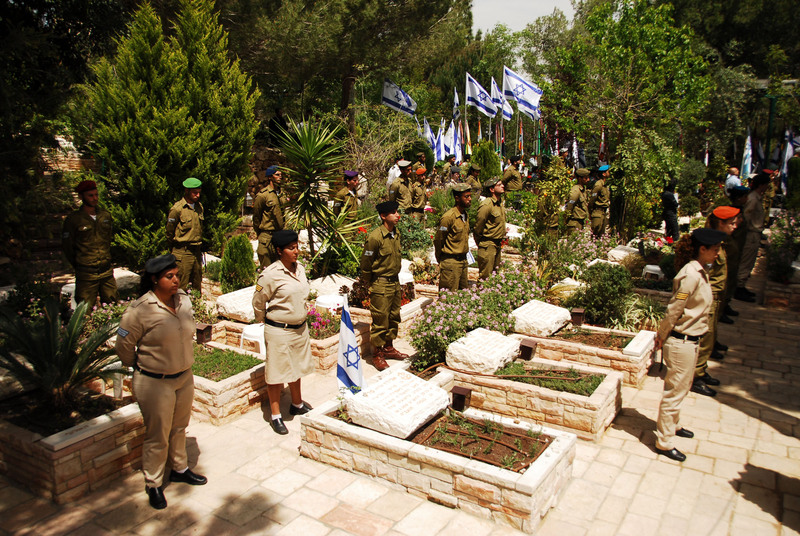 Herzl, the main military cemetery in Jerusalem. As you may remember, I did not serve in the army, but rather chose an alternative available to people who prefer not to serve for religious or moral reasons (usually religious women), known as national service (sherut leumi). You may recall that I worked in the northern office of OneFamily Fund, now called OneFamily Together, an organization that provides emotional, legal and financial support for victims of terror. I could probably write an entire book about what that year was like for me (…actually, I sort of did. 😛 But that’s another story. ), but one thing that it helped me understand was how very, very close these tragedies were to all of us. There are a few people I will be keeping in mind when the memorial siren sounds. One is a young lady named Karen Yemima Mosquera. She was from Ecuador, the daughter of a family with what appear to be crypto-Jewish roots, and she came to Israel to study and do a formal conversion to Judaism. She had completed her conversion process just a few months earlier, and had just begun her life as a fully observant, formally recognized Jew. She was killed when a terrorist veered his car into a crowded train stop, in the same attack that killed a 3-month-old baby. I did not know her personally, but somehow–probably because of my connection with Spanish crypto-Judaism–her story touched me deeply. Another is a woman from my community. Just last week I was looking at an old Google spreadsheet that listed names and phone numbers of potential babysitters, and my stomach fell when I saw her name there. And of course… three of those new names are the names that make every Israeli heave a deep sigh. The names we were posting on social media, chanting in rallies, hanging on signs, wearing on shirts… and then singing mournfully, spelling out using candles, and using to name new initiatives. I will write more about them and the effect their kidnapping and deaths had on us when the one-year anniversary of that event approaches. The events of last summer deserve an entry of their own. After these 24 hours of painful memories, on Wednesday night, we blow out the candles, raise our flags, and celebrate, with public ceremonies, parties, fireworks, and concerts. In the religious Zionist (dati leumi) communities, a special prayer is held after the usual evening prayers, singing various Psalms and verses of praise, and Psalm 126 to the tune of HaTikva1. 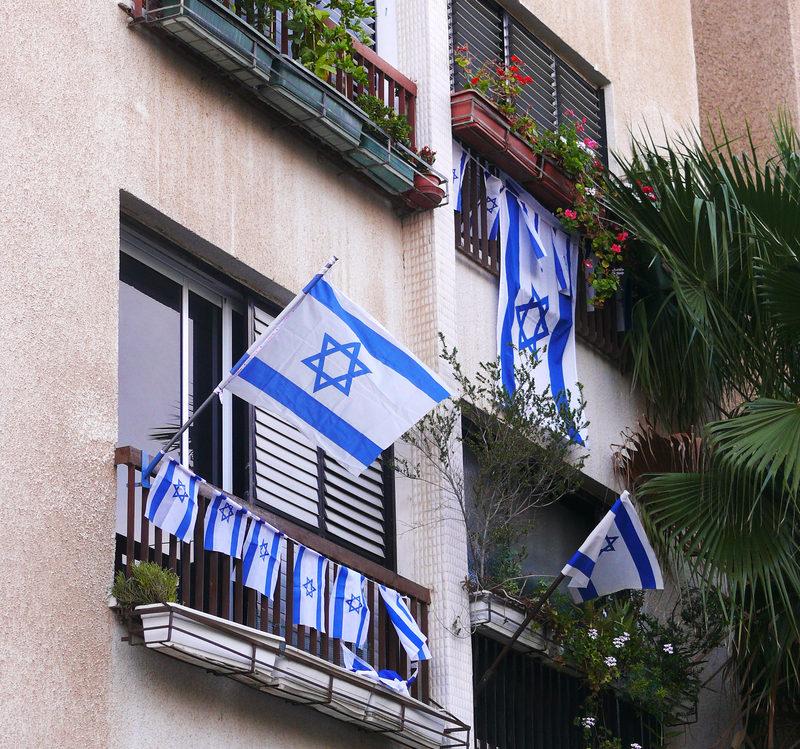 For us, Yom Ha’Atzma’ut is not only a national holiday, it is a religious holiday. We see the foundation of Israel as a miraculous historical event much like the events that we celebrate during Chanukah and Purim2. Older Israelis, secular and religious alike, like to hold “shira b’tzibur”, “public singing”, which is a sort of communist version of karaoke 😛 where the music is played and the words displayed on the screen but everybody sings together. As a teenager I would walk to downtown Rehovot with my friends, where the main streets would be closed to traffic, and there were vendors selling candied apples and other treats, and various Israeli-flag-themed paraphernalia, usually including big blow-up plastic hammers with which kids bonk each other on the head. Don’t even ask me how this became a Thing, but kids also run around spraying each other with “snow foam” and colored spray streamers. Well, I guess it’s slightly better than the Venetian carnival scented-egg-throwing thing. Anyway, during the day, it’s become something of a tradition to have a picnic, usually barbecue, probably because the weather tends to be just right for it and basically any excuse to eat a whole lot of meat sounds good to an Israeli. 😉 Many people dress in blue and white in honor of the holiday, and cakes, cupcakes and cookies are decorated with Israeli flag toothpicks or blue and white frosting or sprinkles. Special prayers are held again for the morning services. Museums, tourist sites, and public parks are open and often admittance is free. The IDF also opens some of its lots to the public, where people can come look at the equipment they use up close. In general, Yom Ha’Atzma’ut is a day to honor and celebrate the soldiers who protect us, so it’s also customary to give them gifts and have kids write them thank-you notes. Very nicely described. I connected with everything you talked about, and yeah, it does feel like a roller coaster ride! Thank you! I love how you express yourself in writing. I feel like I am actually listening to your voice. Can’t wait to meet you in person! I am much less verbal in person 😛 Thank you for your comments, and especially that beautiful blessing you gave Josep for his birthday. I dunno about him, but it really moved me!